When China’s President Xi Jinping visited with President Obama last month, one prickly issue was high on the agenda for the two leaders – China’s activities in the South China Sea and the Spratly Islands. Allies in the region – including Vietnam, Taiwan, Malaysia, the Philippines, Brunei, and Indonesia – would beg to differ. The United States’ chief concern is that Chinese expansion in the region will be militaristic. But my take is somewhat different. An important thing to remember when analyzing China is that it always takes a long-term view. Forget next year. China is focused on five and 10 years from now. For instance, where will China get enough energy to power its huge nation in the decades ahead? One possible answer is the methane hydrate deposite at the bottom of the South China Sea. Methane hydrates are a form of crystalline ice that has methane (natural gas) trapped inside. In effect, it is burnable ice. Just last year, China discovered a high-purity methane hydrate in the northern part of the sea, offshore from the Guangdong Province. The high-end estimate for that reserve is that it contains the equivalent of 150 billion cubic meters of natural gas. That’s roughly equal to 50 years of China’s entire usage of oil equivalents! 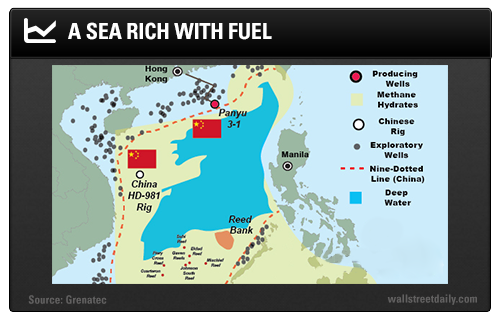 Chinese experts believe the South China Sea as a whole contains methane hydrate reserves equal to 68 billion metric tons of oil. That figure amounts to 130 years worth of the country’s energy consumption. Now it’s easy to see China’s interest in the South China Sea. Still, this will have to be a very long-term investment, even for China. You see, there are big problems with developing methane hydrates. First, any extraction process has to operate at low temperatures and high pressure. The methane hydrate is very fragile, too, and can quickly melt into water and methane gas. That leads directly to the next problem – the environment. Methane is a potent greenhouse gas, said to be 30 times more damaging to the atmosphere than carbon dioxide. Because of these difficulties, the International Energy Agency says that methane hydrate won’t be commercially viable until at least 2030. But that won’t diminish China’s long-range interest in the fuel and the South China Sea. Sydney-based research firm Grenatec specializes in Pan-Asian energy infrastructure. In a recent piece, it named a few other sweet spots in the South China Sea for methane hydrate deposits. Between northern Vietnam and the Paracel Islands. China placed a rig in that area twice in the past year. The Reed Bank area located west of the Philippine island of Palawan. Some of China’s island reclamation efforts are a bit south of Reed Bank. Other potential hot spots include the area north of Taiwan, near the disputed Senkaku Islands. And in the East China Sea, near Japanese waters. To get a pulse on the situation, I contacted the Founder of Grenatec, Stewart Taggart. I wanted to get his thoughts on whether the Chinese were seriously pursuing methane hydrates. He told me the development of this possible energy resource is official Chinese government policy. China stated that it will begin testing methane hydrate extraction technology in 2017 and begin commercial development in 2030. But Taggart did point out that China has a reputation for saying a lot of things that don’t come to pass. Still, he did confirm that the kind of rigs China is putting into the South China Sea, along with the military infrastructure on some strategic islands, are just the type of protective perimeter needed to develop a resource in disputed waters. Taggart and Grenatec are hoping that China goes the peaceful route and works with Vietnam, the Philippines, and others in partnerships. These joint development areas could receive funding from the Asian Infrastructure Investment Bank that China set up. I hope he’s correct. There’s no need for a military dispute over an energy resource that may not even prove viable.